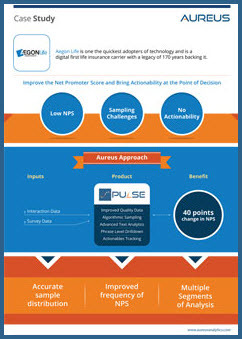 Aureus implemented PULSE to help Aegon Life improve their overall NPS process. Aegon Life had an established Net Promoter Score process to evaluate the overall customer sentiment. However, the NPS was consistently low over a period of time. Fill out the form to see how Aureus Analytics helped Aegon Life improve their NPS.